Want to try 66 new Watercolours for £4.99? | Want to try 66 new Watercolours for £4.99? To mark the Launch of Daniel Smith Extra Fine Watercolours into the UK, you can try 66 different colours from their 230 Colour range for just £4.99. How you might ask? 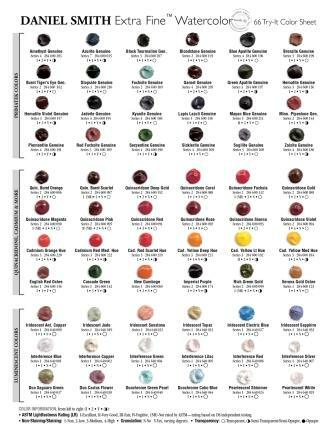 Well they have produced a fantastic 66 colour “Try It” Sheet. The Daniel Smith “Try It” Sheet contains 66 paintable colour dots which you can paint out on to your favourite paper. As their paints are so highly pigmented a bit of their colour goes a very long way. The “Try It” sheet contains a number of the Quinacridones from the range. Quinacridone colours combine the power of the staining pigments with the luminosity of the transparents. They flow beautifully for extremely smooth washes, have incredible depth of colour and can be lifted easily while still wet. They have proved to be very popular since their introduction, as no other colours have both the intensity and transparency of the quinacridone family. They are synthetic organic pigments, created in the world’s most advanced colour laboratories. Miniscule pigment particles are exceptionally uniform in size and shape, which translates into unfailing behaviour in the paint. The quinacridone colour range – rich golds, oranges, pinks, reds and violets – covers a wide swath of the spectrum. Many artists have substituted the fantastic earthy golds and oranges for traditional ochres and siennas, instantly super-charging their palettes with these intense and extremely lightfast colours. You’ll also have the opportunity to try out the Daniel Smith PrimaTek colours. They are unique paints made with pure, authentic mineral pigments that are mined directly from the earth. These colours have captured the imagination of artists for hundreds or even thousands of years. Their diversity is amazing. There are 18 Luminescent Watercolours for you to experience on the “Try It” Sheet. Luminescent Watercolours can be used alone or mixed into standard colours for striking effects of light and colour. Miniscule particles of titanium-coated mica are the secret. Different sized particles and thicknesses of coating provide the dazzling array of choices. Interference and Pearlescent colours appear almost colourless, but when applied over a dark colour they bounce back gleaming colour. The interference colours take on different hues depending on the point of view and how the light is striking them. Viewed from one angle, Interference Green is a shimmering, pearly green. Viewed from another angle, it refracts a reddish hue. The Duochrome colours bounce between two distinct colours depending on the reflective light providing pure visual excitement! The Iridescent colours reflect light directly and provide a fascinating sense of depth, along with intense colour and sheen. The Iridescent colours reflect light directly and provide a fascinating sense of depth, along with a distinctive sheen. The colour ranges of these colours are the most intense. If you are still sitting on the fence we’ll even post the Daniel Smith “Try It” Sheet to you carriage FREE !!! To Learn more about the range and each colours properties follow this link DANIEL SMITH EXTRA FINE WATERCOLOUR PAINTS.